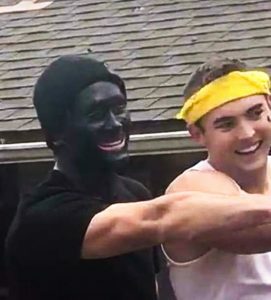 Cal Poly made international news April 8 when a photo of Lambda Chi Alpha member Kyler Watkins in blackface circulated social media. Lambda Chi Alpha President Logan Boersma told Mustang News April 8 that the blackface was not racially motivated. 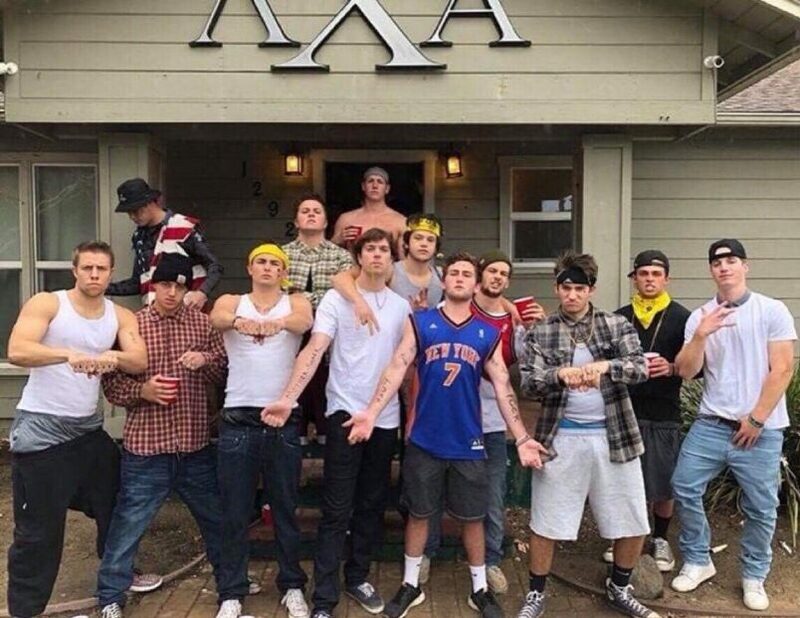 Instead, he said the photo was taken at a brotherhood event where Lambda Chi brothers were grouped in teams based on different colors. Historically, blackface derives from white actors painting their faces black to depict slaves and freed black people onstage during minstrel shows that started in the mid- to late-nineteenth century and lasted well into the 1950s. The practice created caricatures of black people, mocking and dehumanizing the community and perpetuating racist stereotypes since. Recently, an Atlanta school came under fire after schoolchildren performed a poem for Black History Month while wearing blackface masks. Time and again, fraternities nationwide have sparked outrage for racially insensitive behavior. Some fraternities have been suspended and disbanded over blackface incidences. In 2013, Phi Sigma Kappa held a ‘Colonial Bros and Nava-Hos’ themed party, which gained widespread attention. 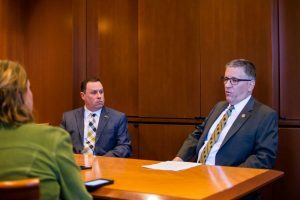 University President Jeffrey Armstrong sent a campuswide email April 9, which said the university was investigating the incident. 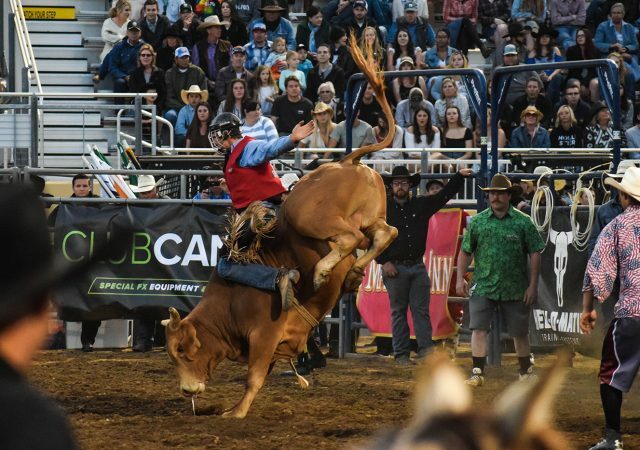 “Like many of you, I have seen the images that circulated on social media and find them to be painful and embarrassing. 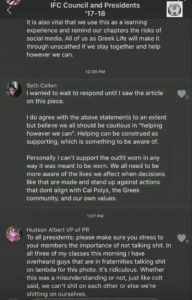 As president of Cal Poly, and on behalf of the entire Cal Poly family, I am ashamed,” he wrote. The fraternity was placed on a probationary suspension by the Lambda Chi Alpha national organization and the university April 9. During a probationary suspension, a fraternity must cease all functions while the university conducts a review to determine whether anything that happened at the fraternity’s event was in violation of university policy and/or the recognized student organization code of conduct. Lambda Chi will remain suspended until at least April 29, 2019. All Lambda Chi officers resigned their positions and two members resigned their membership following the suspension. Watkins also resigned from Lambda Chi. The Lambda Chi Alpha national organization will conduct a membership review and potentially enforce further disciplinary action. 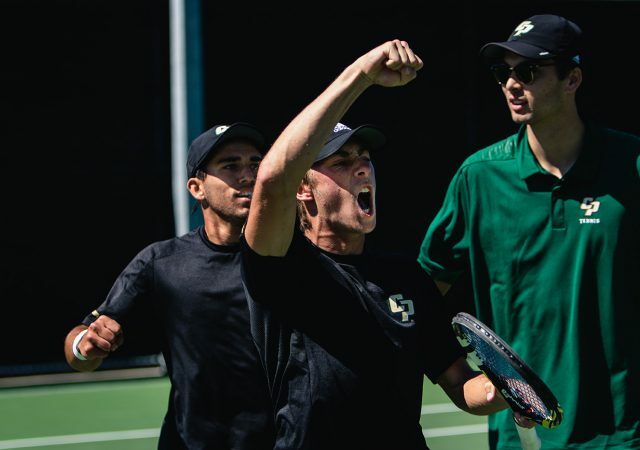 Amid the backlash surrounding Watkins, Lambda Chi and the university, many campus clubs and organizations wrote letters of solidarity with students of color. 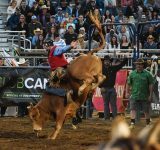 Read the letters Mustang News collected here. 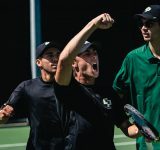 At the IFC meeting April 9, fraternity presidents symbolically voted unanimously to suspend Lambda Chi Alpha, showing their support with the university and national headquarters’ decision. No Lambda Chi representatives were present at the meeting because the fraternity had been suspended by national headquarters and the university prior to the meeting, according to IFC president and political science junior Colton Marino. However, Lambda Chi Alpha member and agricultural business senior Jack Gilchrist was present. 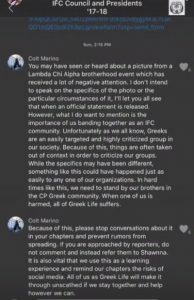 Gilchrist was representing IFC as the Vice President of Risk Management, so he was unable to comment on Lambda Chi matters. Protesters attended the meeting, demanding a response from Lambda Chi. When the meeting concluded, protestors asked Marino to lead them to the Lambda Chi house on Foothill Boulevard. Once at the house, protesters called for Lambda Chi members to come out. One Lambda Chi member answered the door, but quickly closed it, not speaking to any protesters. 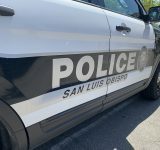 The San Luis Obispo Police Department arrived soon after. After about 15 minutes, protestors dispersed to attend an Emergency Town Hall. 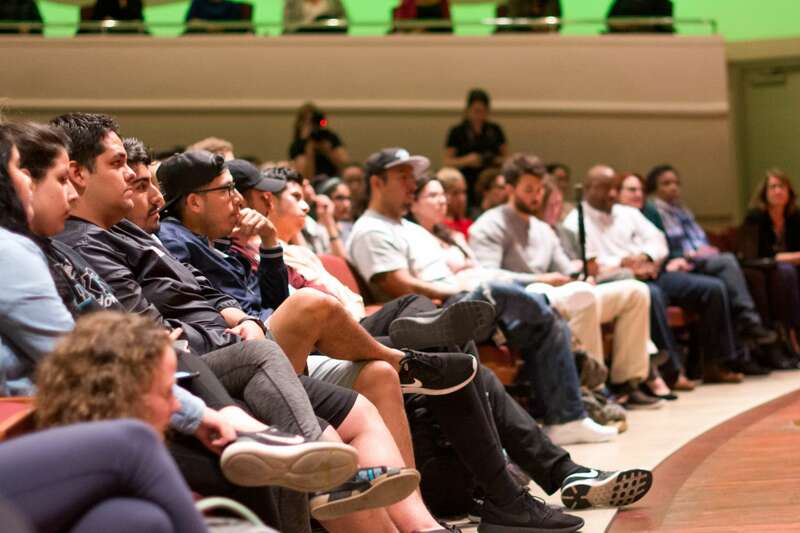 At the Emergency Town Hall April 9, the voices of students of color were centered. Speakers talked about the Lambda Chi member in blackface, but also about the campus climate surrounding race. “We worked almost a year to tell these kids, ‘You’re safe here, you can find a home here.’ Only for these actions to throw all of that away,” one speaker said. Associated Student Inc. (ASI) President Riley Nilsen was called to the front of the room to speak after someone called her out for a comment made during the IFC meeting. The crowd booed Nilsen and called for her resignation. Nilsen later apologized for her comments on her personal Facebook. 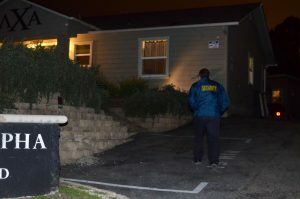 Lambda Chi hired a security guard after the fraternity’s house was vandalized April 9. 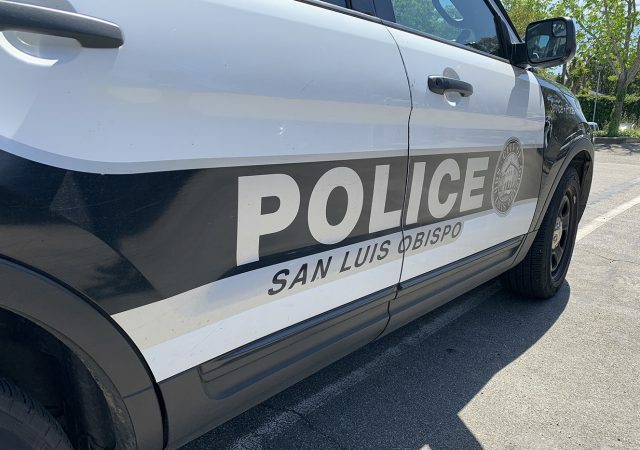 According to San Luis Obispo Police Department (SLOPD) Patrol Lieutenant Brian Amoroso, four figures in black hoodies were caught on camera throwing balloons filled with water and black paint at the house. 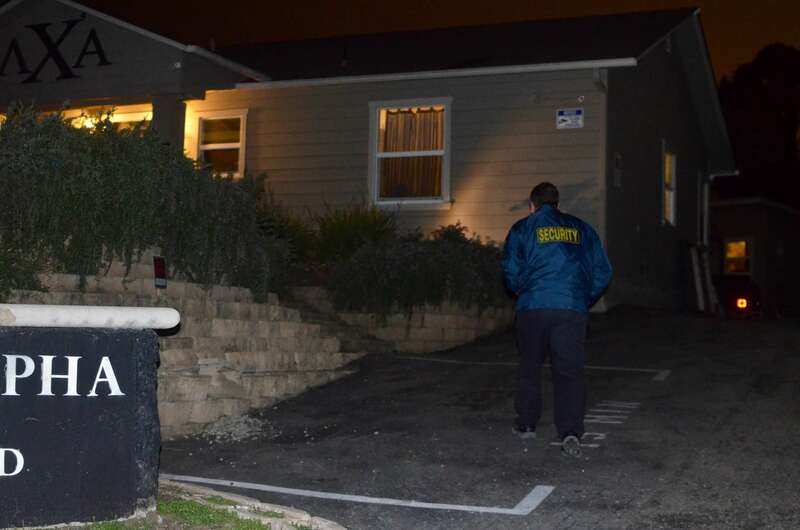 SLOPD was called to the house four times April 9, but no one was charged. Armstrong sent a campuswide email April 9, addressing the situation. Though Armstrong said he personally found the photos of agricultural business senior Watkins and Lambda Chi horrific, there were limitations as to how he could punish the student. Armstrong said he cannot expel a student for wearing blackface because that would violate free speech laws. Mustang News sat down with Armstrong and Vice President of Student Affairs Keith Humphrey April 12. Armstrong said the university is following the lead of Lambda Chi Alpha’s national organization in determining a punishment for the fraternity. “What I’m not saying today is how long that should be because I’m not making that decision and I don’t know if they should be off campus permanently. 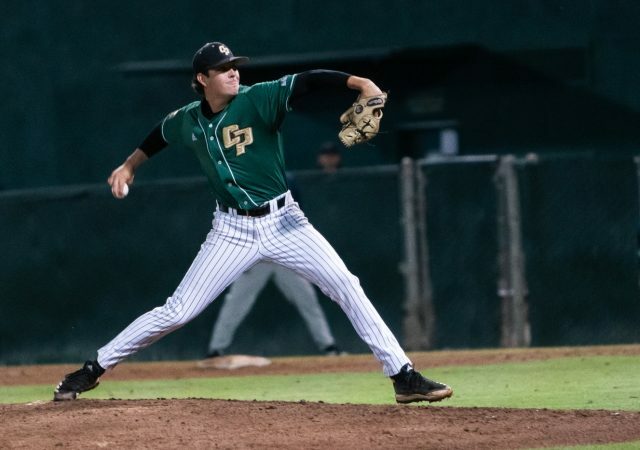 That’s not a decision I’m making today and it’s not a decision that I do make as part of our process,” Armstrong said. In the April 12 interview, Mustang News asked Armstrong what concrete steps the university is taking to better the campus climate and make students of color feel safe and accepted on campus. Armstrong did not propose new solutions to campus climate issues. Instead, he listed initiatives the university has already been working on to increase diversity. 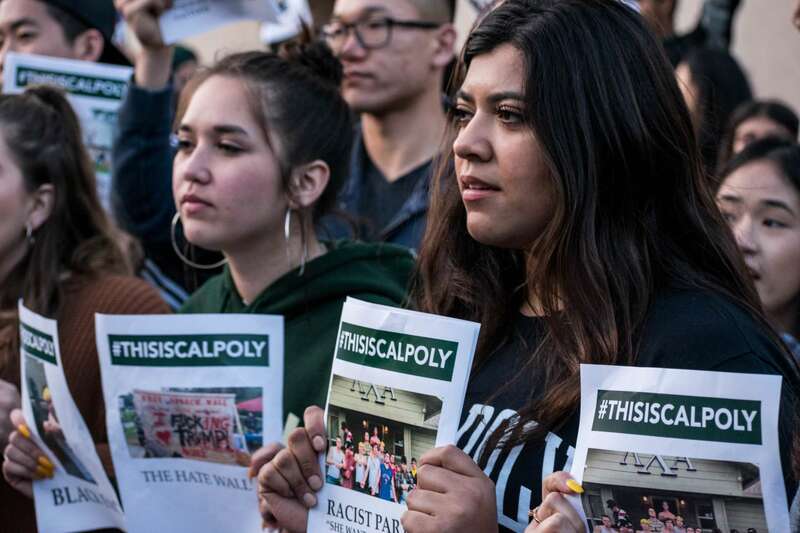 Armstrong also cited the proposed Cal Poly Opportunity Grant and Fee as a solution to Cal Poly’s diversity problem. “The data is very clear that the majority reason why our low income and majority diverse students [shows] that financial is a barrier. It’s a barrier. Because of our fees. 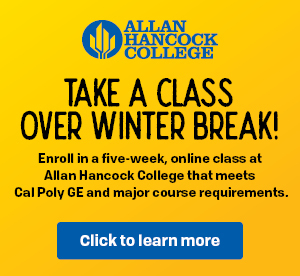 And our fees are what make Cal Poly Learn by Doing. And really why all of students get great jobs and placement is so high,” Armstrong said. 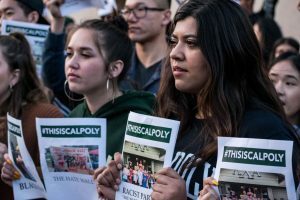 In an on-camera interview with Mustang News during Open House April 14, Armstrong acknowledged that he wanted to do more for students of color at Cal Poly. IFC fraternity chapter presidents voted to place all IFC fraternities on social probation until further notice April 12. They said during this time the IFC Executive Board will work on a plan of action that will be released April 20. 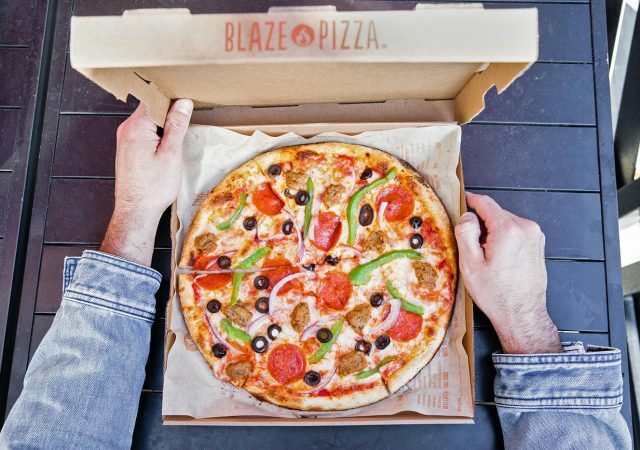 “We want to acknowledge our role in contributing to an environment that perpetuates racism and are making a commitment from this day forward to hold our community more responsible and hold them accountable to the values we strive by,” the press release said. However, the same day, text messages in ‘IFC Council and Presidents ’17-18’ group chat was leaked. 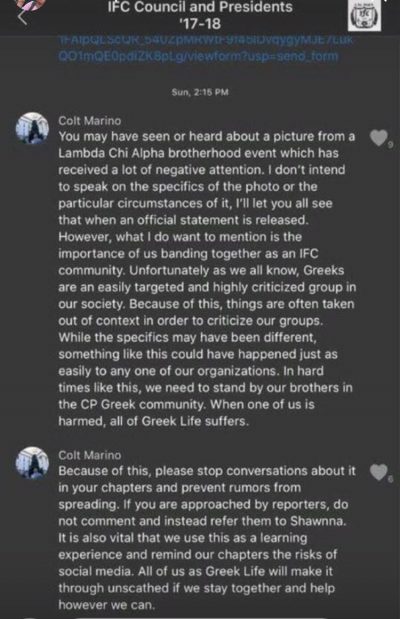 In the group chat, Marino advised IFC members and chapter presidents to stop conversations about Lambda Chi to prevent rumors from spreading. Marino declined to comment on the text messages. 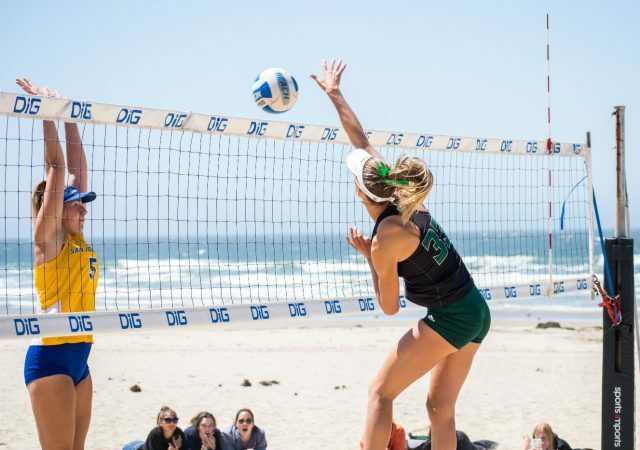 Cal Poly’s Open House began April 12 at Farmers’ Market in downtown San Luis Obispo. Students put up booths and held signs addressing the blackface incident and race issues at Cal Poly. Economics senior Lauren Quinta said the students at the protest chose to be disaffiliated from any organizations to encourage unity and solidarity. Armstrong, the Office of University Diversity & Inclusion (OUDI) and Student Affairs held a student forum April 12 in the Performing Arts Center to address the blackface incident. “I called my mom to tell her I was coming to this forum and the first thing she told me was that I should stay safe and not go. That says a lot about our climate here,” one student said at the forum. 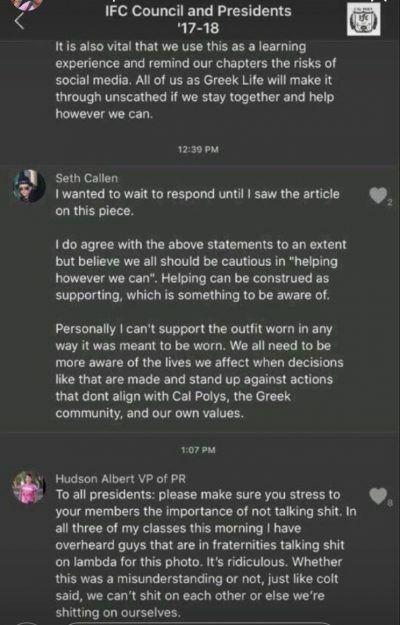 Many students called Armstrong out for not caring about the campus climate at Cal Poly. Armstrong reiterated that he has no legal power to expel Watkins. The Drylongso Collective, a collective of students affected by the “inaction of the Administration,” released a list of demands April 13. Among the demands was more funding for resources for students of color. 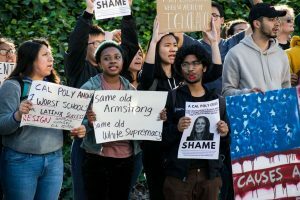 “We want Administration to match the $55,000+ spent on security for Milo Yiannopoulos’s 2017 visit to the Cal Poly San Luis Obispo campus— in addition to the estimated costs for his upcoming 2018 trip— and devote these funds toward resources for the Black Academic Excellence Center, Cross Cultural Centers, Ethnic Studies Department, Women & Gender Studies Department, Queer Studies Minor, and Science, Technology & Society Department. The funds will be utilized—as these entities see fit— for resources that include, but are not limited to, staff, space upgrades, programming, etc,” the release said. The demands also included increased funding from ASI to cultural clubs and comparative ethnic studies classes to be a general education requirement. 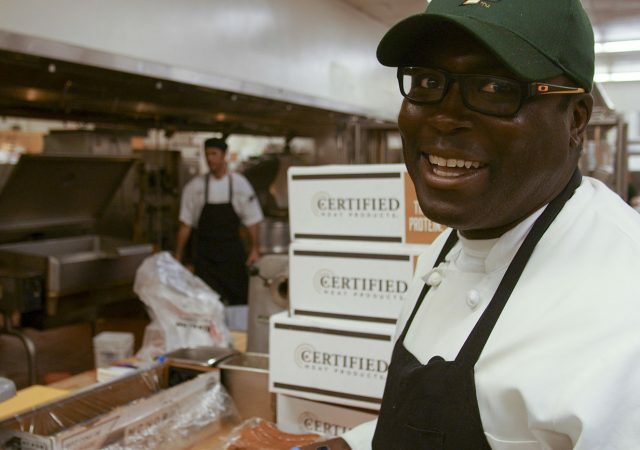 Agricultural business senior Watkins released an apology letter April 13. In the letter, Watkins said he did not know the historical significance of blackface and wrote he was simply “going all out” as a member of the “black team” at the Lambda Chi brotherhood event April 7. “I’m very open to a dialogue with anyone or any student group who would like to discuss increased diversity awareness within the Greek system and the school as a whole,” Watkins wrote. Hundreds of Cal Poly students gathered April 13 at 8 a.m. in the parking lot near Doerr Family Field to protest administration and race issues at Cal Poly. Protesters chanted “Lambda Chi, you should die,” and “Bye-bye Lambda Chi,” as prospective students and their families toured campus. The students called for Armstrong’s resignation, increased allocation of funding to multicultural clubs and programs and the end of greek life at the university. 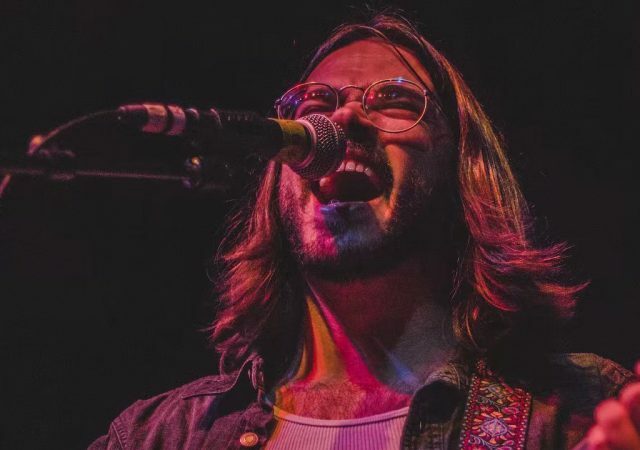 “The culture of indifference toward racism is so deeply embedded that frat boys will throw parties like this,” anthropology and geography junior Kelsey Zazanis said. 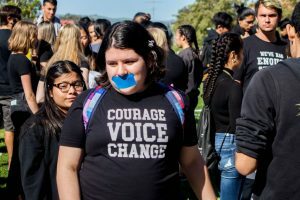 During an “Open House Coffee House” event in Chumash Auditorium where prospective students’ parents could get academic information, students silently protested in the Julian A. McPhee University Union. More than 40 clubs boycotted the Open House club showcase April 14. Participating clubs set up their booths for Open House, leaving a statement of solidarity with Black, Latinx and indigenous students. 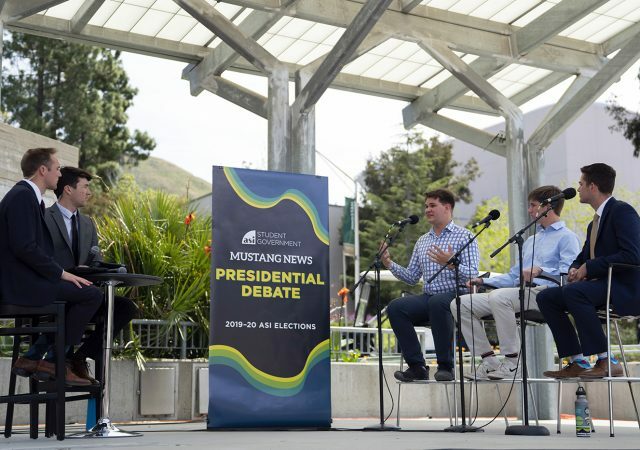 The booths were left unmanned, with only the letter and information about race issues at Cal Poly remaining. Students marched off campus to Santa Rosa Park instead. No IFC fraternities and Panhellenic sororities had booths at the club showcase. United Sorority & Fraternity Council set up booths, but did not have any members present. History senior Vanaaisha Pamnani marched in solidarity with students of color and said she Armstrong’s response appalling. 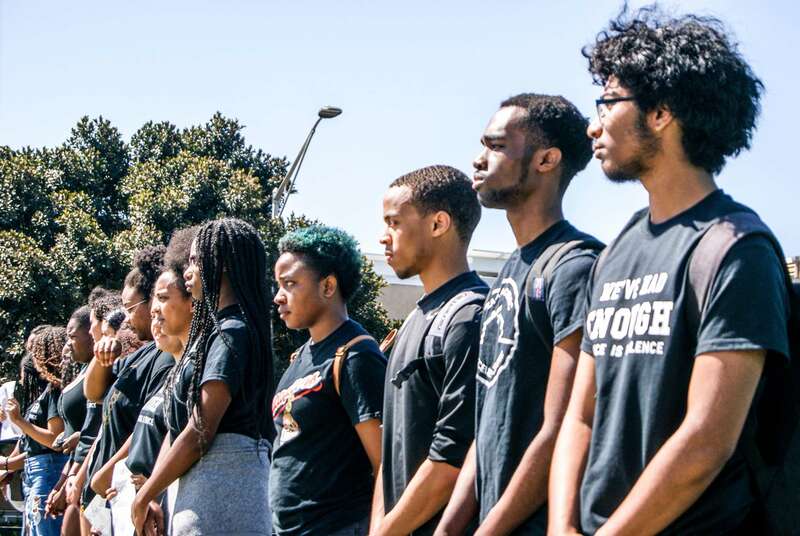 Correction: A previous version of this story said the Black Student Union released a list of demands. It has been corrected to the Drylongso Collective.